There’s no questioning that Chip Kelly revolutionized not just the Oregon offense, but college football itself. 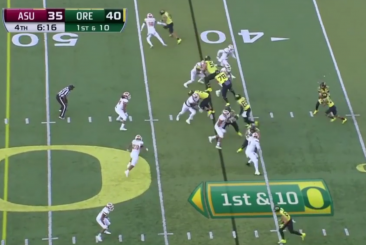 While Mark Helfrich largely sustained that offensive success with quarterback Marcus Mariota, since he left for the NFL we have seen gradual changes to the Oregon offense. The question today, as Oregon struggles on all fronts, is, are we witnessing the demise of the Chip Kelly revolution, or merely an evolution of the Chip Kelly offense to suit the players the Ducks have and the defenses they face. Given the talent Oregon has on offense, and despite the true freshman quarterback, Justin Herbert, I would posit that we are witnessing the demise, not an evolution. If you don’t know the basics of the Kelly offense by now, then I suggest you read this article and watch these FishDuck.com videos. The video below with Kelly explaining the offense to Urban Meyer is also a good – and short – tutorial. The Kelly offense is really not that complex and has been duplicated in some fashion or another many times since it began bearing fruit. Like all offenses, it’s predicated on obtaining an advantage and exploiting that advantage, e.g., more blockers than defenders or a faster offensive player against a slower defender. The way all offenses attempt to achieve this is different, but the goal is the same. Create an advantage, exploit the advantage, gain yards and score points. When Helfrich took over pretty much everyone expected that the offense would continue as it had under Kelly and Mariota, and the results would differ little. Coach Helfrich, after all, was Kelly’s offensive coordinator and oversaw the implementation of the Kelly offense. This largely turned out to be true, but small changes in the offense did occur and were documented here at FishDuck.com. The biggest and most obvious change was a more balanced attack, with closer to a 50/50 split of running and passing plays, whereas Kelly’s offense was typically 65/35 run-pass. Helfrich took advantage of Mariota’s mastery of the offense and accuracy with the read-option and short passing game coupled with a fiery tempo. Oregon loved this offense, and it kept them in the top 5 statistically for several years. Although the entire playbook wasn’t open to him and he battled some injuries, Vernon Adams largely sustained the Ducks’ previous success when he was on the field. But he also expanded Oregon’s offense in some subtle ways: the never-ending QB scramble and a deft touch on the long ball. I’ve mentioned this several times before in various locations, and I’ll say it here again emphatically: Vernon Adams’ scrambling made a huge difference last year in the Ducks’ offense. He extended a ton of plays that normally would have resulted in sacks or incomplete passes. By running around like a mad man at times, he allowed receivers extra time to get open. This aspect to his game alone elevated the offense last year and definitely helped them win several games. Where other quarterbacks in this system might take a sack (Dakota Prukop) or take off running (Mariota), Adams bought more time and that equated directly to yards and points. 2016 is the first year with Matt Lubick as offensive coordinator. It’s somewhat difficult to analyze the offense given that they’ve had two very different quarterbacks who have played, but I believe they have enough information to attempt to draw some conclusions. But first let’s take a look at the offense overall in comparison to 2015 when Scott Frost was still at the OC helm, and Adams led the charge. In 2015, Oregon ran 993 plays, 618 runs and 375 pass attempts – 68 percent runs and 32 percent passes. This is actually up from the typical 65/35 Chip Kelly split. However, if you remove quarterback runs from the equation, almost none of which were called QB keepers in 2015, you end up with 57 percent runs and 43 percent passes. So in terms of called plays, this latter stat is more accurate. Vernon averaged 1.8 yards per carry, for example, an average that reflects positive runs, scrambles and sacks. This 2015 offense ranked 5th in the nation with just more than 7 yards per play and 538.2 yards per game of total offense. Over the course of the season, the Ducks averaged 43 points per game. They lost the games in which Vernon was out or injured; they won the rest. Case closed. In 2016 through 10 games, they have run 747 plays, 420 runs and 327 pass attempts, or a 56-44 run-to-pass ratio. Because Herbert has had so many called quarterback keepers, I’m leaving his rushes in, along with Prukop’s, as he was successfully running the zone read, which is basically the same as a called run play. In many cases the play call for Prukop was a quarterback keeper, but they disguised it as a zone read option. When you see blockers pull for him, however, you can easily discern that he was meant to keep it all along, and thus it is not a true zone read option. Surprisingly, this leaves the Ducks with almost exactly the same split between 2015 and 2016 in terms of run/pass balance. Thus far this year, however, Oregon’s offense is ranked 22nd in the nation after 10 games with 6.61 yards per play and 494.1 yards per game. Their points per game has dropped to 37.1. In short, the offense is performing worse than in 2015, a fact born out not just in stats, but in several close losses. I can guess what you’re thinking: four redshirt freshman offensive linemen and a freshman quarterback, and I’ll grant that those two factors have played a significant role. But I believe that the offensive play calling has also played a significant role. Let me be clear here – what I’m talking about is the play calling with Herbert, because he’s the future. The play calling with Prukop was different. He has much more experience and could actually run the entire Kelly/Helfirch/Frost offense. Herbert, as a true freshman, was never expected to make difficult reads, and thus the offense has changed dramatically to better suit his abilities, or lack of experience, depending on your perspective. First a quick look at the offense under Prukop. I’ve put together a video of a few plays that help highlight the difference between an experienced quarterback who can run the entire offense, and Herbert. For reference, Prukop this season completed 65.7 percent of his passes with 8.5 yards per attempt, 8 touchdowns, two interceptions and a 152.7 QB rating. Herbert has completed 63 percent of his passes with 7.8 yards per attempt, 15 touchdowns, 4 interceptions and a 151.0 QB rating. I also wondered how the run game has fared under the two quarterbacks. Under Prukop, the Ducks averaged 255 yards per game and 6.04 yards per carry, against, on average, the 63rd ranked defense (I counted UC Davis as the 129th best defense to average them in). Under Herbert the Ducks averaged 256.4 yards per game and 5.58 yards per carry, against, on average, the 67th ranked defense. So the Ducks have been slightly worse running the ball with Herbert at QB, against slightly easier defenses overall. Although Prukop has missed a few wide open receivers deep – and threw a terrible fade in the loss to Colorado – overall he ran the offense well. He was efficient, rarely turned the ball over, kept up the tempo and could take advantage of the entire playbook. Some of his plays were like slow-motion Mariota. 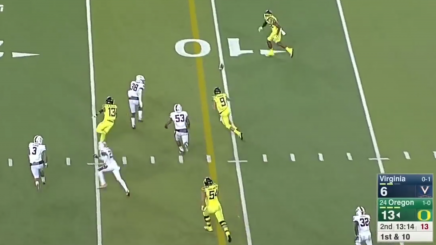 They reminded you of something Mariota would do, like taking off running and then pitching it outside – just slower. There are a few notable differences in the Lubick offense with Herbert. First, we’ve seen the quarterback keeper with much more regularity. I imagine this wrinkle was introduced in lieu of the zone read, which Herbert is not ready to run. This is a called quarterback run, typically up the middle after a short drop, essentially a draw play. I don’t have stats on this but if memory serves me it has been successful, but not wildly, as Herbert is not very fast. Another difference is the use of tight ends, at times even three on the same play. What I’ve observed are a lot of throws to the tight ends in the flat, and this makes a lot of sense. Pharaoh Brown and Johnny Mundt are two of Oregon’s best players, they are a difficult match-up for opposing linebackers and as long as the linebackers are giving the typical cushion (or if they’ve been rubbed), the risk is low and the likelihood of success high. The other notable differences: No zone read, no option plays, no zone read triple option (for an example of the zone read triple option watch this and understand) and play-action on third-and-long. Gone is the true bubble screen – haven’t seen that in ages, and trust me, I’ve been looking. Gone is the zone read that turns into an outside pitch-throw option. Gone is the fake bubble screen pump and go. I can’t recall if I’ve seen the sweep play with Herbert either, a play they often run that is usually a fake sweep to draw the safety away from a receiver. 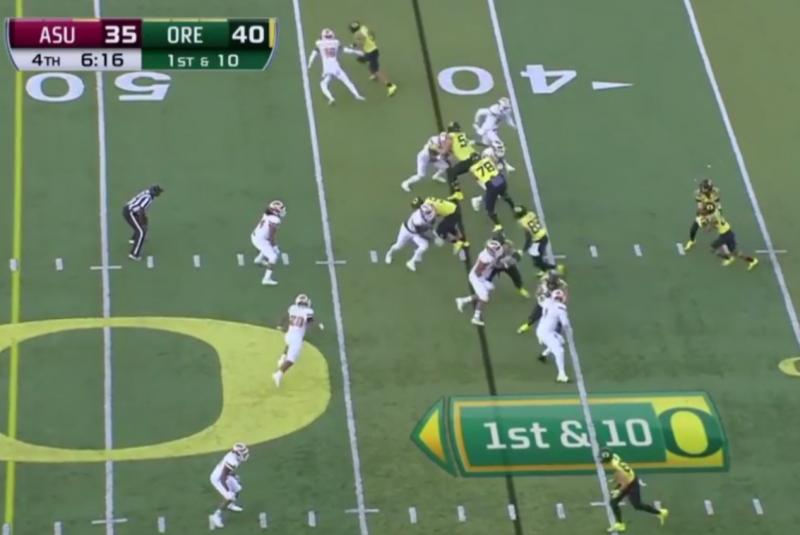 This next video shows a few plays that appear tailored by Lubick for Herbert. These are plays we’ve seen often since Herbert took the helm. Note that throws and/or pumps to a receiver running to the flat is not the same as the bubble screen. I get it, Herbert simply isn’t ready. The mesh point of the zone read takes time to master to avoid fumbles and the option pitch or throw on the run does. as well. These are plays Adams and Prukop had years of experience with and Herbert has none. Play-action on third-and-long has been very frustrating to watch. And when I say long I mean there is “no way the Ducks are running it” long. You are essentially taking an offensive player out of the play. I can’t explain it, perhaps someone can in the comments. I will point out that Lubick is having Herbert run the FZR, that is, the Faux-Zone-Read. This is where you put it in the belly of the running back with no intention of ever handing off and running with it yourself. I haven’t seen every Herbert play this season, but I only recall one true zone read that was a run, and it was against Stanford. When Herbert tried to pull it, it was fumbled. I never saw the zone read again that game. The zone read with no threat of the quarterback keeping it is not a zone read at all, it’s just a regular running play. And defenses have been ignoring Herbert on these plays, literally, nobody shadows him, because they’re all watching the same tape and have identified the FZR. Well, that’s not entirely true. There were a few times that an Arizona State player kept a lazy eye on him for a second, but we’re talking about Arizona State. Their defense makes even Oregon’s look good, although statistically they’re slightly better; as is Akron, Rice, Bowling Green, Ball State, and Hawai’i (a small part of me just died inside after typing that). Many plays this season have resulted in deep routes vs one-on-one coverage. Normally, this is great. This is what the Kelly offense is meant to create, but unfortunately neither Prukop nor Herbert have shown the ability to consistently deliver the deep ball, often to wide open receivers with several yards of separation. This has, in some cases, been the difference between a win and a loss this season. If I had all of the game tape, I could put together a fairly long and disheartening video of just long-ball misses. The offense, as defined by Kelly/Helfrich/Frost is gone, and we shouldn’t expect to see it back anytime soon. Hopefully, with additional reps for Herbert, Lubick will see fit to bring back some of the hallmarks of the Kelly legacy that kept them in the top 5 in total offense for so many years. In doing so, perhaps he can establish an identity for his offense and get Oregon back to its winning ways.